BOOKS: I adore my husband, who I have known since 1960, and my children and their families - including 6 grandchildren. I prized my career, my City, and now retirement. But from early childhood, what I loved most was books. 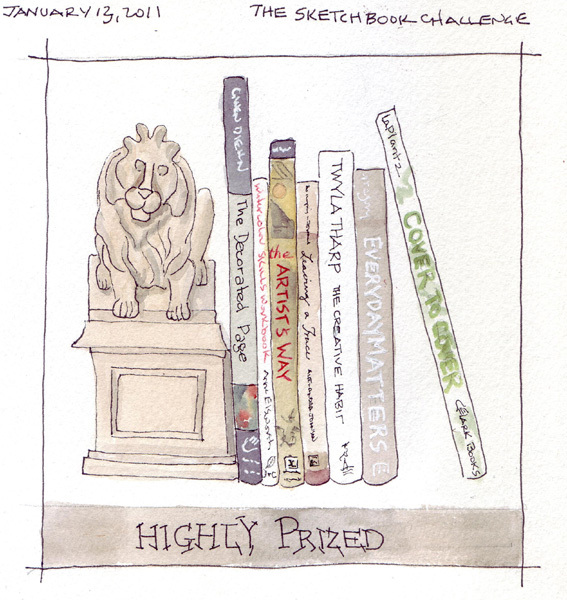 For this challenge I decided to paint a journal page with several books that are responsible for guiding me down my current journey - drawing, painting, and writing. I found Gwen Diehn's book, The Decorated Page, in a local store one day in 2003 when I visited with a gift card in hand. I was thrilled to learn about visual journals and travel sketchbooks and started to play with one - and some student grade watercolor paints. I was still working long hours and it took me 2 years to finish that watercolor journal. I used Linda Elsworth's Watercolor Skills Workbook to learn the basics about using watercolor and to select my artist grade watercolor palette, and that same month I started Julia Cameron's book The Artist's Way - a book I had on a shelf for many years. I completed all 12 weeks and loved writing morning pages, even though I had to get up earlier before work. I was always too busy to keep a journal when I was working and raising a family, but I suddenly became interested in journals and read and loved the Alexandra Johnson's book Leaving a Trace, which reinforced my daily journal writing. I was making two quilted, silk painted/dyed wedding chuppahs for my two sons' weddings during 2003-4 and 2004-5 and found Twyla Tharp's book, The Creative Habit, and devoured it. During that same time I was reading Artist's Sketchbook magazine and thinking about my future creative projects and when I partially retired in 2005, found Illustrated blogs online. Reading these led to Danny Gregory's book Everyday Matters, and the Yahoo Group of the same name and in January 2006 I started my blog. The following year I started what would become 3 full travel journals (150 pages of watercolor paintings - see London category on the right sidebar) while my daughter was living in London, and struggled with finding the perfect watercolor sketchbook - with just the right paper. I bought Shereen LaPlantz's book Cover to Cover and began making my own watercolor journals. Through these books and many more, I am enjoying myself more than ever and love retirement! I still did my first 20 minute pose in 9B graphite. The contrast was increased a little for posting. Joan was sitting right next to me! Our small, but active, Journal Study Group, had two guests this past Wednesday - Gwen Diehn and Vivian Swift. Gwen is an honorary member now that she has a grandson in Brooklyn and we always look forward to her visits. Her husband Phil usually joins us for the day's activities and on Wednesday he took this picture of the group. We had a long brunch at Landmarc in the Time-Warner building at this great table for 8, discussed everything art-related, and passed around sketchbooks. Gwen is a fabulous bookbinder so we also needed to consult her on several upcoming projects. There was eating, laughing, and a great exchange of ideas. After brunch we walked across the street to see the current exhibits at the Museum of Art and Design (M.A.D. ), followed by late afternoon coffee, tea, and ice cream in the Museum Cafe for some of us. Vivian left us mid-afternoon to deliver the manuscript of her new book to her publisher! 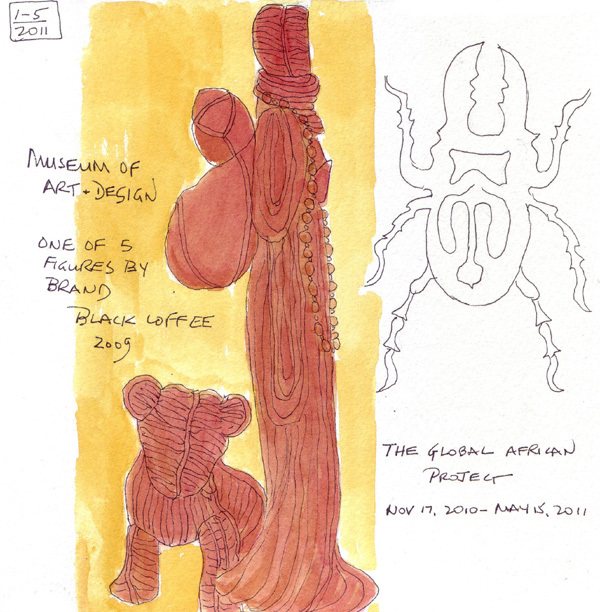 The Global African Project is the current large exhibit at M.A.D. and most of us gravitated to this tableau by Black Coffee (the brand for 2 South African designers) for sketching. 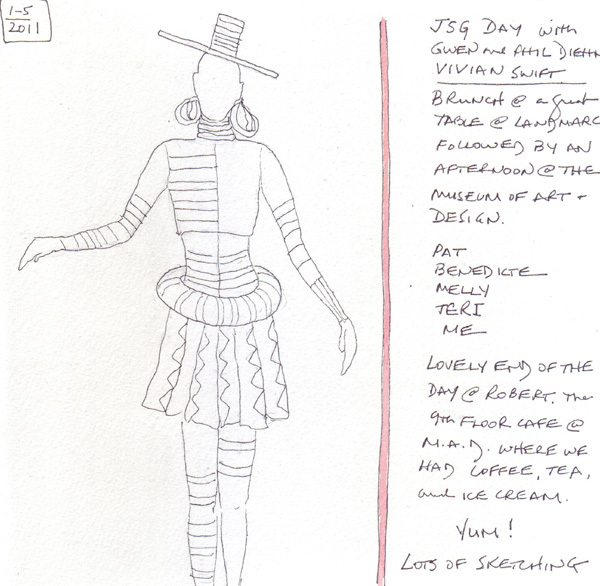 I sketched one of the figures and the dog, followed by a figure and costume by Missoni Spa from 1990. I feel so fortunate to have such an inspirational group of friends in NYC. 1. Maintain an artist journal - doing one page per day minimum - to include illustrated journal pages, travel sketches, skill practice pages, figure drawing, etc. I did maintain my daily sketching, doing at least one journal page per day with only a rare "missed day." When I’m just too busy or tired to do one, I usually add two sketches the following day. And on sketchcrawl days and on days when I go to figure drawing I have as many as 19 sketches for the day. 2. Publish blog entries twice each week - share EDM challenges and other select pages in order to participate in an online art community. I posted to my blog twice weekly almost every week and everyday in May - an ongoing project. I love my friendships which began because of my blog and continue to be amazed at how important it is for communication among like-minded people. This year I spent time with two EDM members - in person (Liz and Raena) and met 2 members of my Journal Study Group because of my blog. I stopped doing EDM challenges early this year and haven’t figured out why. It is probably a combination of having enough self-imposed challenges and exercises to do from some of the books I read monthly. 3. 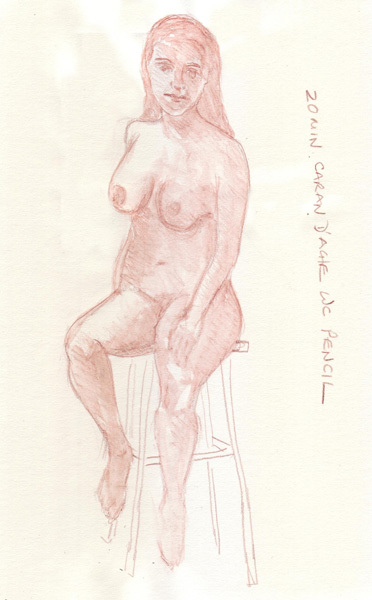 Attend Figure Drawing sessions at least 1-2 X /month. Try other tools and techniques during 20 minute poses. I attended monthly figure drawing sessions at the Society of Illustrators and went twice during several months, especially to make up for their closure during August. The only new tool used was a blending stump - but I did sketch more faces on the figures, so I think I’m progressing. 4. Build More Art Skills: Prepare a schedule for working through my art technique library - resuming Dodson drawing book exercises this month. 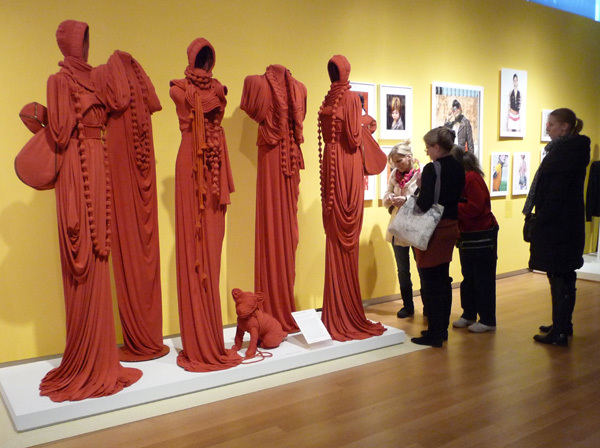 Copy the Masters in Museum exhibits locally. 5. Continue with Sketchcrawls, Meet-up Central Park Drawing Group, Journal Study Group to sketch NYC. 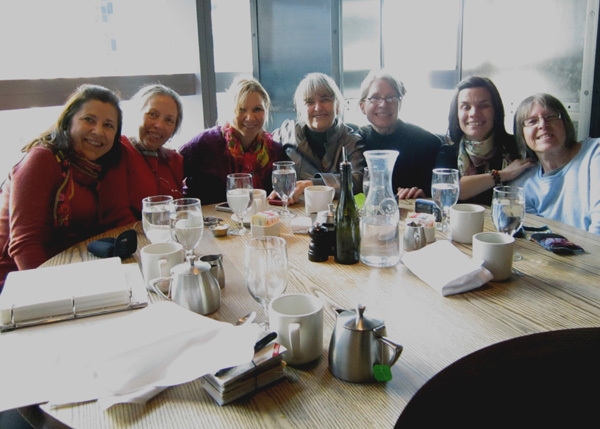 I have a wonderful group of friends to sketch with - the Central Park Drawing and Meet-Up Group that meets now twice each month (except during the coldest months), and my Journal Study Group. I also spent 3 days with EDM member Liz Steel who was visiting NYC from Australia and spent an afternoon sketching with Liz and Jason Das (Urban Sketcher). 6. Deal with my Internal Critic and Fear of Failure: Develop a strategy to fool my internal critic so I can continue to add to "My Apartment" journal. The journal and project need to be converted from "too precious" to a playful experience using some of the strategies I have copied and saved from my reading. When EDM member Casey Toussaint was visiting me this summer, we discussed this common problem and challenged each other to do at least one more page in the sketch books that we made during our bookbinding class. I have now completed a total of 2. I have no problem using my other hand bound watercolor sketchbooks or plain watercolor paper or the Strathmore Visual Journals that I received from Rice Freeman Zachary as a "giveaway." There is something about the fact that the above mentioned precious sketchbook was made during my only bookbinding workshop and is as perfect as a sketchbook can be because of the equipment available. I have tried lots of new tools this year - Schminke watercolor paints in cool and warm triads, a Pentel pocket brush pen, a ruling pen, dip pens with several types of nibs, several types of paper, including Yupo, Neocolor II watercolor crayons, and Shiva paintstiks. I also learned how to make foam stamps and copied a master painting in stamps and learned how to make and use Thermofax screens. My art buddies challenged me to make a multimedia book using everything I owned - working in layers - and with many images per page and I completed a 16 page journal. 8. Bookbinding - continue to make watercolor journals for myself, trying different sizes and my own dye painted fabric as book cloth. I learned how to make book cloth from my hand dyed and painted fabrics and made 7 watercolor sketchbooks for my daily journal. In addition, I made several other types of books including a hidden spine and Australian piano hinge book (both inspired by Gwen Diehn) and another recycled book for summer beach paintings. 9. Optional: Add to Theme Projects (London, NYC) - Try to complete some other pages in these 2 journals or just get over the angst of having two unfinished journals and move them to the "completed journals shelf"
I completed 11 pages in my NYC recycled sketchbook this year and I’m almost done with it! Most of my NYC sketches are in my regular daily sketchbook, because that is what I carry with me, so I will not make another NYC sketchbook when this one is done. I’m going to move my London book to the finished stack because I completed 3 fifty page sketchbooks during our many visits to London in 2006-7 and I really don’t enjoy sketching from my photos now that we are home. 10. Keep myself open to new projects and adventures. Be willing to "stretch" whenever the opportunity arises. I think that this was easy to accomplish, because I was surrounded by such wonderfully creative friends and our Journal Study Group provided amazing inspiration and lots of sharing of specific skills. And as added inspiration, Gwen Diehn became an honorary member and spent full days with us when visiting her family in NYC. I make fabric ornaments for our Christmas Tree every year and I'm now trying to paint all of them to have images I can play with. 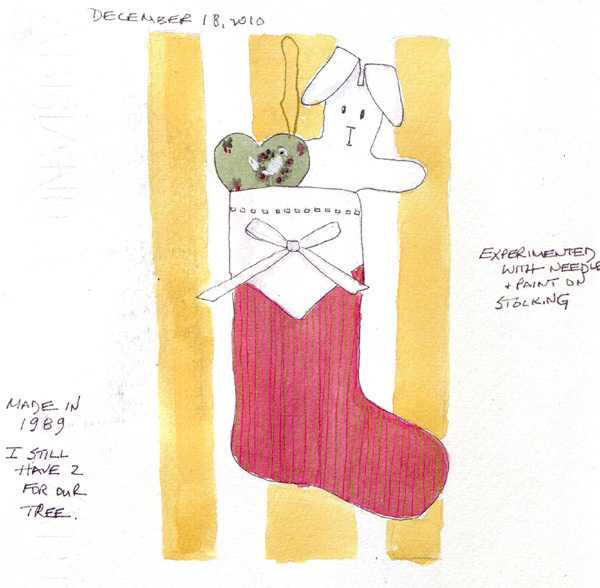 This small stocking was made in 1989. My daughter and I took Sydney to the NY City Ballet version of The Nutcracker this week. She loves the Mouse King, but I painted him after we went last year. 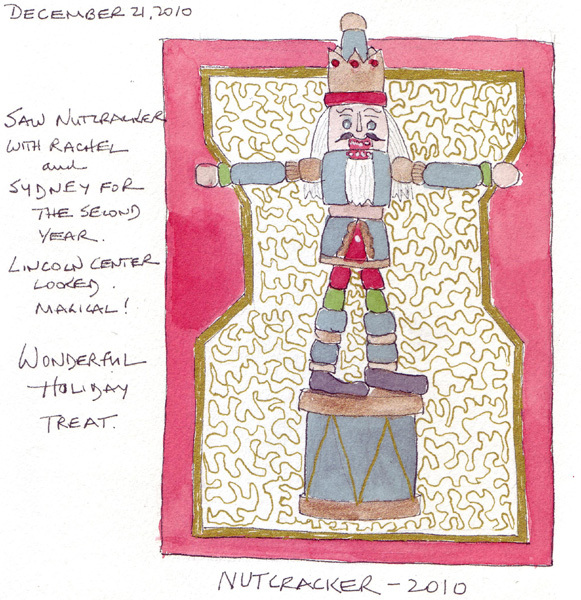 This year I decided that we really needed a Nutcracker drawing - and I sketched this one from a little ornament I bought for her. I still have two more small stocking stuffers to sew today, then tomorrow I'll make the flourless chocolate cake for Christmas Eve dinner here with all of our children and grandchildren. My husband is making a rib roast, and creamed spinach. I just need to bake bread and make rice pilaf. We love Christmas!